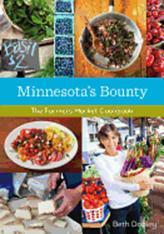 Beth Dooley: Minnesota's Bounty: The Farmers Market Cookbook! So happy to share this wonderful review in this week's PUBLISHER'S WEEKLY for Minnesota's Bounty: The Farmers Market Cookbook. It will be available in stores next month. Mette Nielsen did such an amazing job with the photos ... you can pre-order a copy on line by going to the "Find My Books" link to the right. Please come to the Mill City Farmers Market book launch, May 11! Exciting, Beth! What a terrific review! I can't wait to pick up a copy.